Great. Another third-person shooter. Oh crud, another robot uprising. It's easily the most generic shooter I've seen in my entire life! Those are just some of the vices I've heard regarding Binary Domain. I'll admit, I was excited for it when Sega first unveiled the squad-based shooter, although it was a cautious kind of excitement. 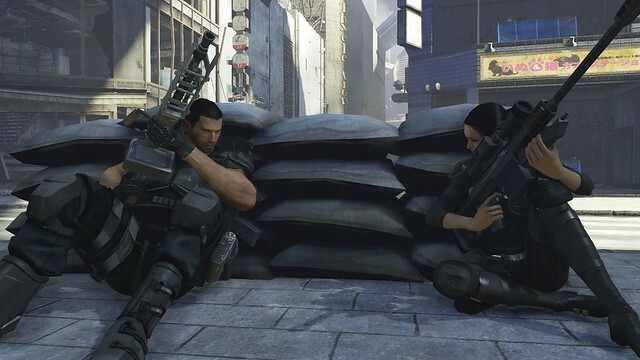 Toying around with Binary Domain at E3 only proved to justify the feeling, making it one of the few shooters that I'm actually looking forward to playing when it's out early next year. The premise has been talked to death. It's a robot uprising. Some jerk secretly gave the AI ego and emotion, now they aren't happy with the way humans are treating them, leading to a revolution of sorts. However, this isn't Terminator. In fact, the vibes I'm getting share similarities to Ghost in the Shell and Appleseed, which is a lot more relatable considering its philosophical roots. Can sentient robots co-exist with humans? Or is destruction really the only solution? Think about that. It's a third-person shooter with squad-based mechanics. You issue commands to teammates, take cover, and take out as many robots as humanly possible. 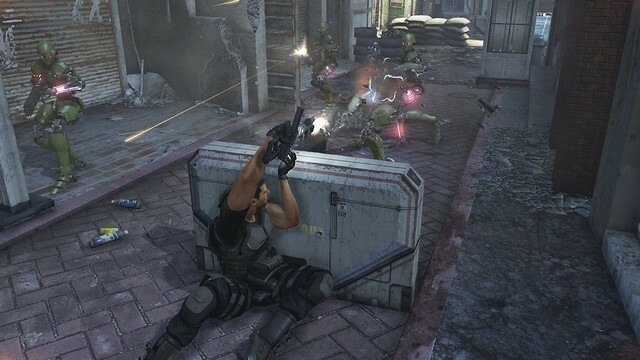 What makes Binary Domain unique is the implementation of a trust system. Throughout the game you can recruit soldiers to your squad, gain their trust and based on that, they'll either follow your orders without question or doubt your command, do their own thing, and leave you for dead. Each squad-mate will progress depending on how often they're deployed. Gain enough experience and you can upgrade them accordingly. In addition, Sega's also making good use of voice commands. Squad orders can be given out simply by yelling into your mic set. Things like taking cover, suppressive fire, charging, healing a fallen squad-mate and whatnot are some of the basic ones. What was more impressive with the demo was that the AI for your squad-mates actually reacts to your commands. Give them something outrageous and they're likely to scold you a crazy fool. As for the enemies, it isn't as simple as mowing down mechanical bots. Taking after games like Dead Space, you can blow off an arm and the robots will still keep coming. Blow off a leg and they'll keep crawling. Blow off a head and even though they lose their tracking system, the bots will still do their best to put you down, even if it means friendly fire. Not only does this "strategic dismemberment" work on a mechanical level, it looks great aesthetically. Actual parts, shrapnel and even bits of paint get blown off when shot. The enemy AI will also take the opportunity to flank you if given the chance. In the demo, larger bots with mini-guns provided cover fire while the smaller assault classes moved in for the kill. What you can do when it comes to strategy, these robots can essentially do the same. It's a good thing the AI for your own squad-mates are just as smart. Ironically, they didn't blindly advance like I did, but shouted out warnings when I got ahead of myself. One squad-mate even provided cover fire while another attempted to revive me when I had fallen. It's quite fascinating to see the concept of artificial intelligence being explored as a narrative when the AI mechanics themselves are so impressive. To be frank, Binary Domain made me look bad. In a good way. Sort of. By the end of the demo, I was face to face with a giant killer robot spider. The scale was grand although the battleground seemed pretty bare. Granted, it was an open courtyard, although I have to question why a rocket launcher and its ammo supply was lying dead in the middle of it. Regardless, the firefight was certainly exciting. Combine that with commanding your squad on the fly with voice commands and Binary Domain is certainly an experience you don't want to miss.